Your real estate agency needs a great website. So here are my 5 tips to help you create a website that retains, engages and connects. A strong website is an integral piece in your digital arsenal. Like hosting an open house you want to create a positive first impression that builds credibility and attract new clients. With the real estate industry getting more competitive just simply having a website isn’t enough. Ask yourself this, would visitors come to a home-opening that doesn’t look appealing? No? So why will potential customers trust you if you have a poor website? So lets get going! Here are my top tips to creating a great real estate website! Welcome your visitors as if they were coming to an open house; greet them and ask how you can help- visitors to your website know what they’re looking for, they don’t want to be bombarded with ads and pop-ups or spend too long searching your website. Direct them to where they need to navigate- whether it’s making an appointment or searching for a property or agent. Ray White’s homepage is the perfect example of directing its visitors to what they need the most. Images are a powerful element of your website. While good copy, call to actions and design portray important information and keep visitors engaged. Imagery has the power to evoke emotional connections of ideal lifestyles and living scenarios which can often be the defining mark between a sale or not. You should try to use the very best images possible for a listing and throughout your website. It will look more professional and more likely for visitors to trust you. 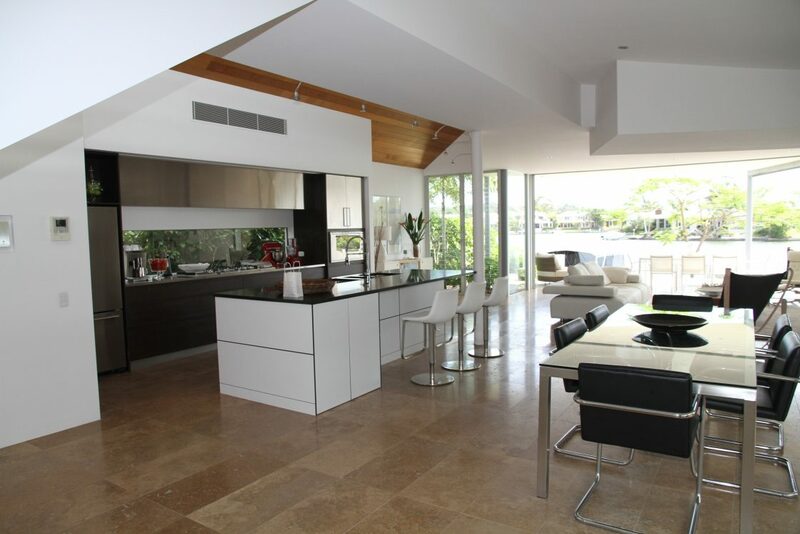 The kitchen is often the number one selling point in a house. On your website, the search tool is your number one selling point. You’ll get some customers who are more experienced and know what they’re looking, while others are first-time homebuyers and have no idea where to start. By placing a search tool that benefits all visitors you boost your chance of gaining leads and potential clients. 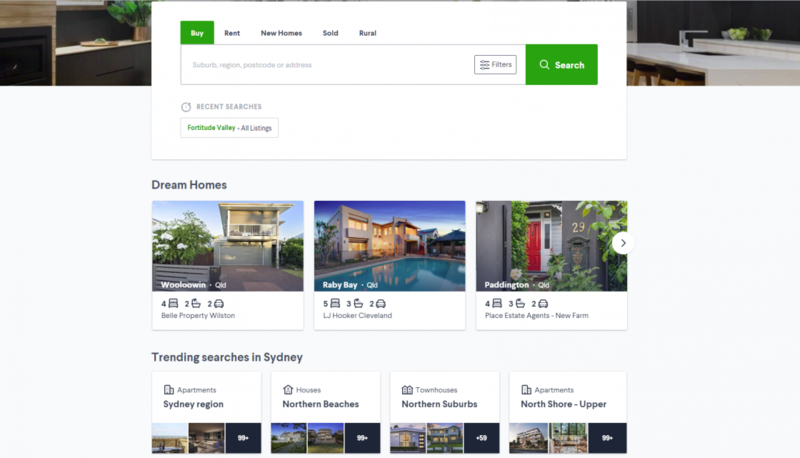 Domain’s search tool caters to all visitors whether they are just beginning their search or those who know what they are looking for as seen by their trending searches and dream homes categories. Your website is not measured by clicks and views, just like you wouldn’t measure a home opening by the number of people who visit. Your website should be a tool to connect and engage. Encourage visitors to provide their information using call-to-actions that direct visitors to a blog, contact info, freebie or booking. 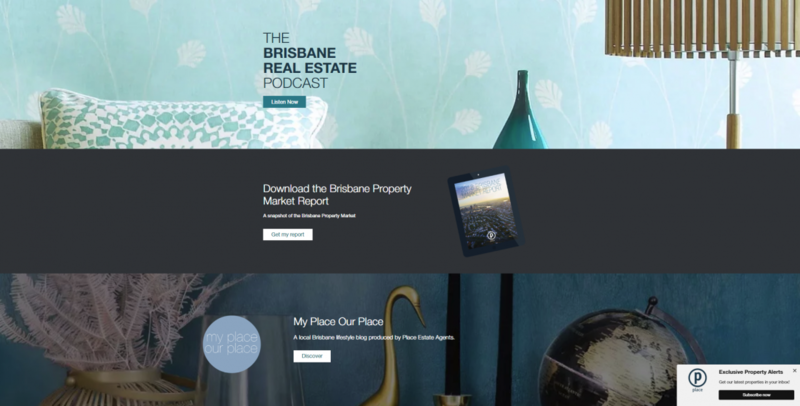 Place’s CTAs provide 3 “in your face” ways for visitors to continue engaging with them with a podcast, the last property market news and their lifestyle blog. 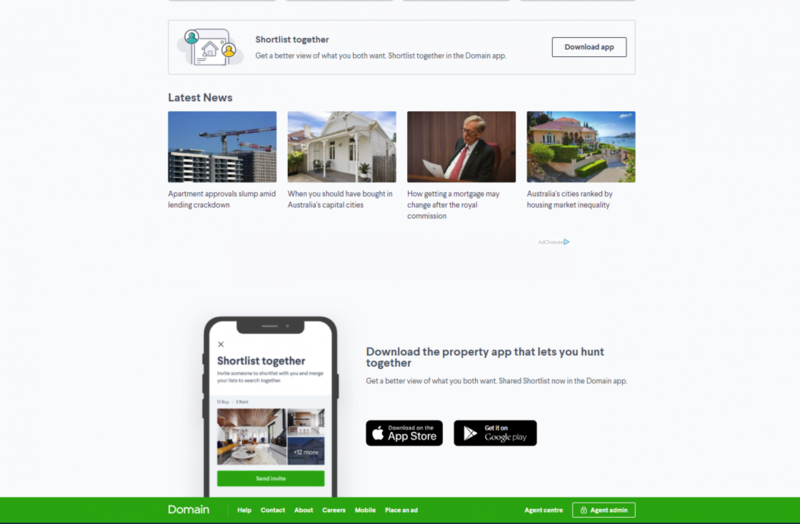 Domain’s CTA introduces visitors to their app and encourages them to download it to search for new properties from their mobile. The power of word-of-mouth can be the key to your real estate agency attracting more business. Testimonials that show your agency in a good light and highlight your strengths will boost your credibility and brand loyalty. Think of your website as the first step of the open house experience. Visitors want information instantly but enough to make a decision, to be told what to do but the freedom to choose and the assurance of why. And most importantly, your website needs to retain, engage and connect. If you’re struggling to design your website or just looking to improve it, these tips can help you. P.S. Website Blue can help you create a responsive mobile friendly website. If you need your website to be taken to the next level, we’d love for you to get in touch and to find out what we can do for your business. We’d love to know your thoughts. What tips are we missing that you think makes a great real estate website?